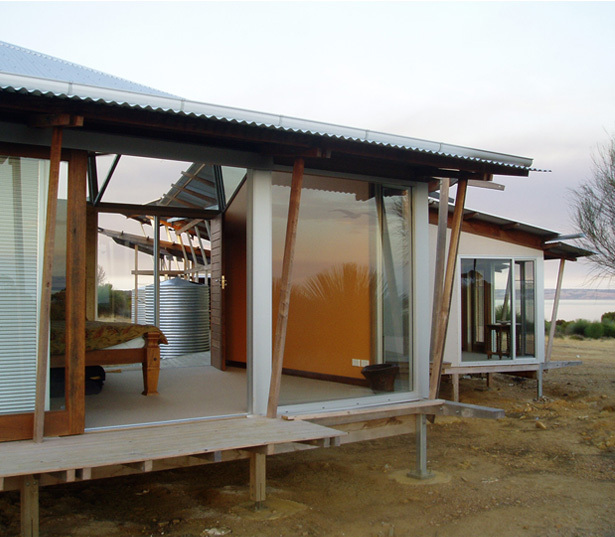 The Martin Hetzel Beach-house is sited in a ‘bush’ setting high above American River, an estuary breeding ground of South Australia’s favourite fish, the King George Whiting (best simply pan-fried with a squeeze of lemon). Didn’t have to look hard for inspiration there. The shifting fluid forms and fins and things just swish and sway their way out to sea. Again rammed earth balances glass. Siting and the structure’s thin form afford a range of indoor-outdoor connections. And just to make sure that you can’t help but get involved with the local kangaroos and anteaters, movement between all spaces is by a zig-zagging verandah edge on the house’s leeward side.